Stevie Ray Vaughn also had a key turnaround he was known to use in his brand of Texas Blues. The advantage to having this turnaround in the key of E in your playing is that is serves well as both a lead and rhythm guitar part. We are playing all 6 strings, and will try playing this two different times. The first time, let's try it slowly with a backing track. As usual, use the AB looping tool if you need too. 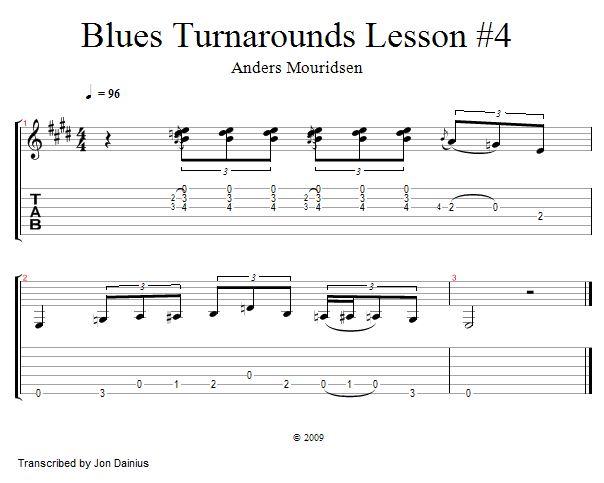 Second time, we will play through the 12 Bar Blues Form twice. Make sure to solo through the form, and than play the turnaround lick to start the form over and end it. We will add a nice alternative ending to the end of our example to cap things off. Let's get to it!